I can’t participate because of this event, but maybe you can? 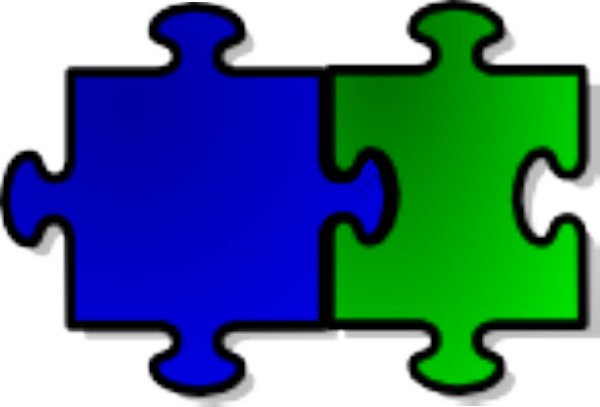 Categories: General | Tags: SeaMonkey, statusmeeting | Permalink. Unfortunately I currently have no information for which SeaMonkey versions these Lightnings are suitable,I asked frg to leave a comment here. Categories: General, News, QA Test Builds | Tags: Addon, Lightning, SeaMonkey | Permalink. User sg9s offers several current SeaMonkey builds from latest Source: SeaMonkey 2.49 | SeaMonkey 2.53 | SeaMonkey 2.57 | SeaMonkey trunk, all for WINDOWS and Linux. for me suffers from this Chatzilla problem (related to User Profile). Categories: News, QA Test Builds | Tags: 2.49, 2.53, 2.57, Linux, Trunk, WINDOWS | Permalink. And thanks again for WG9s’ great work contributing test builds for SeaMonkey 2.49 | SeaMonkey 2.53 | SeaMonkey 2.57 | SeaMonkey trunk,! Categories: QA Test Builds | Tags: 2.53, 64bit, build, mail, SeaMonkey, WG9s, WINDOWS | Permalink. Here I will publish results of (very) short tests of my tests for add-ons from Classic Add-ons Archive with SeaMonkey, until we will have found a better place. 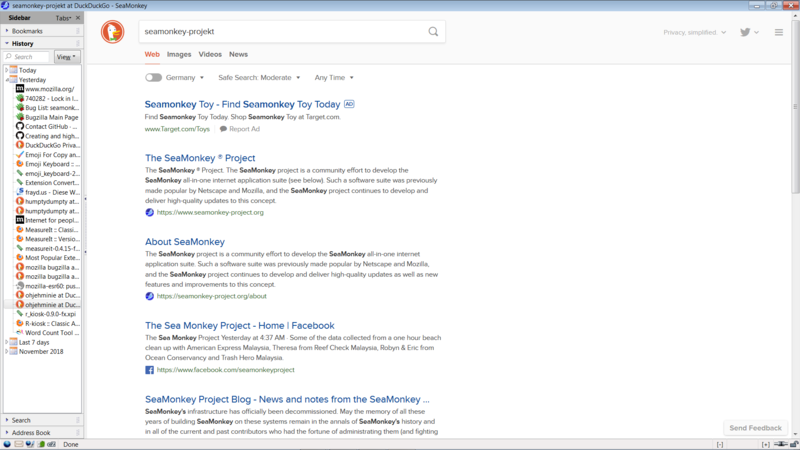 Installation of the converted add-on adds Ecosia to Search Sidebar Panel as currently active search engine. The results of a small sample look very similar to DuckDuckGo, but I read that the results are from bing. The search engine is really useful for me. Here you find some hints on Wikipedia. currently I do not know whether that very old (2010!) add-on does work or does not. 👍 I am using LinkChecker [converted] version 0.6.7.1 by Kevin Freitas, which works fine. Unfortunately I do not know a source for it, the Web page is dead. May be you want to try download from chip.de? I did not get it working with my SeaMonkey 2.53, no button to start the PDF creation offered, also not when I tried to add one using context menu ‘customize’. Installation works fine after conversion, but I can’t find out how to use the add-on. I don’t find any new context menu entry, button or similar. 👍 MeasureIt 0.4.15 by Kevin Freitas: After conversion add-on installs and works fine with WIN SM2.53 (separate User Profile for tests). Creates a launch icon for the add-on in the SM Navigation Toolbar. After click on icon you can mark a rectangle on the screen, dimensions in px will appear. I haven’t a clue for what I should need that, but it works. Can not be used any longer with any browser, required infrastructure does no longer exist. pdfdownload.org hat become part of the Nitro Family. After conversion add-on installs and works fine with WIN SM2.53 (separate User Profile for tests). 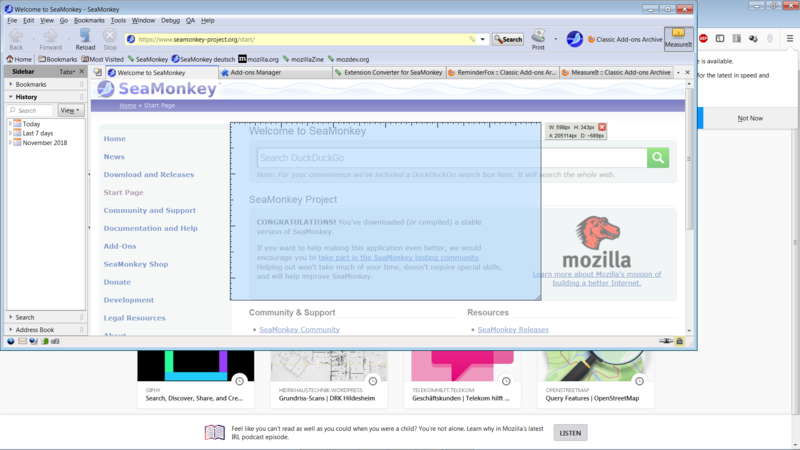 After relaunch of SeaMonkey the browser will be in “Kiosk Mode”, no Menu Bar, no Navigation bar or similar is available. But it is not a perfect Kiosk, Sidebar is still active, so that Bookmarks, search and so on still can be used. May be you should disable Sidebar before relaunch? ⚠️ R-kiosk only can be disabled after SeaMonkey Browser has been launched in Safe mode. After conversion add-on installs and works fine with WIN SM2.53 (separate User Profile for tests). 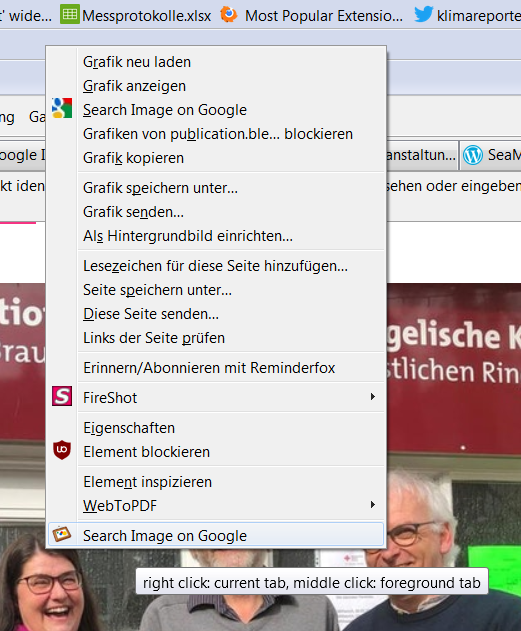 After relaunch of SeaMonkey the browser will show a Save as PDF — Icon at the right end of the navigation Toolbar. Works fine, PDF- results look very similar to source page, contain working hyperlinks, what makes those PDF documents much more useful that the output of printer solutions like FreePDF (my one might be outdated). But unfortunately there also are pages where the results of this add-on are completely unusable, for example heavens-above.com/skychart2. Result here! After conversion installation works fine. The add-on adds a new item to context menu for rightclick on web page contents with several sub items. I tested ‘Safe as PDF’, works fine. Result is only graphic, no text search, hyperlinks, … . For me that is not very useful. PDF export for this page see 190201_TestResultsForAddOnsFrom_ca-archive_ SeaMonkey InternetSuite! If such graphic export is all you need the tool offers a quick and simple solution. 👍 Google Search by Image 0.3.1-signed.1-signed [converted] works fine. 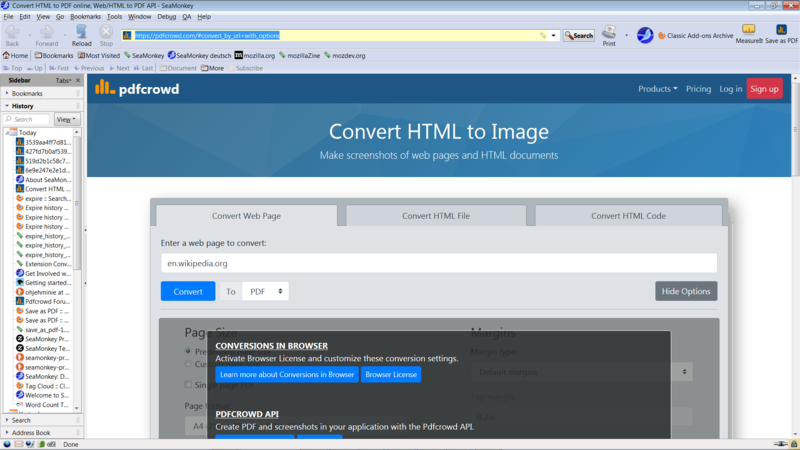 The add-on adds an Item to the context menu which appears when you click on an image on a web page. The search results differ a little from the ones Google Image Search does find, my tests were not intensive enough to tell whether there migt be an adventage for one of the add-ons. For the shown image i got this with Google Search by Image and this with Google Image Search. For your own results please leave a comment including a link to a screenshot, I will move your results from Comment to this blogpost. Categories: Add-Ons, Tipps and Tricks | Tags: Add-Ons, Addon, ca-archive, SeaMonkey, userexperience | Permalink. After some trouble I managed to install it to SeaMonkey, but I doubt that it works. I observed 10 minutes of database provisioning … without visible progress. I hope it will be possible to fix that. I will keep you up to date here. Categories: Add-Ons, Tipps and Tricks | Tags: Add-Ons, Addon, ca-archive, SeaMonkey | Permalink. I will lurk a little, suggest to do the same to all interested users! And may be we even can contribute some good ideas? Categories: Allgemein | Tags: SeaMonkey, statusmeeting | Permalink.